Might the thought of “Why on earth would you put makeup on Furniture?” be running through your head as you read the title of this post? The van Gogh chalk paint collection has this super fun line of finishing products for your pieces that are insanely easy to use. I know there are plenty of people who read this blog and aren’t near a van Gogh Paintologist (what we call our retailers) so I’ll be doing a series of posts as I finish pieces to highlight the products in the collection and hopefully give you some inspiration to give them a shot. 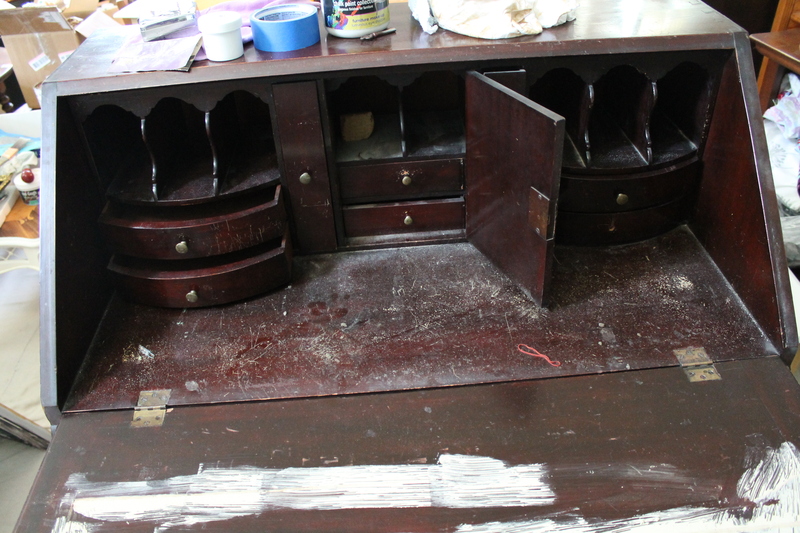 Today is all about Furniture Facelift. 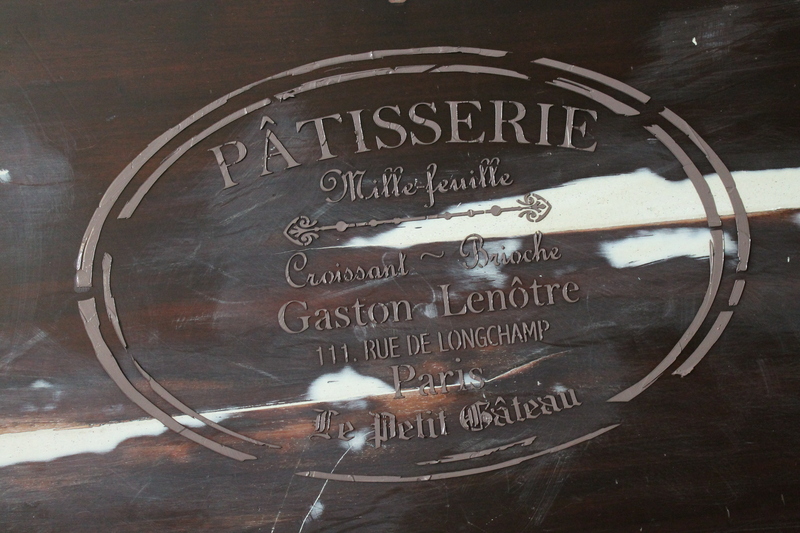 It’s an embossing plaster designed to give you a 3-dimension design on pieces using a stencil. You can make a relief design that looks like it’s part of your piece for ages, or you can use it as a filler or skim coat on cabinet doors to cut down on the appearance of the wood grain. A few weeks ago I had this secretary dropped off on my front porch… really. 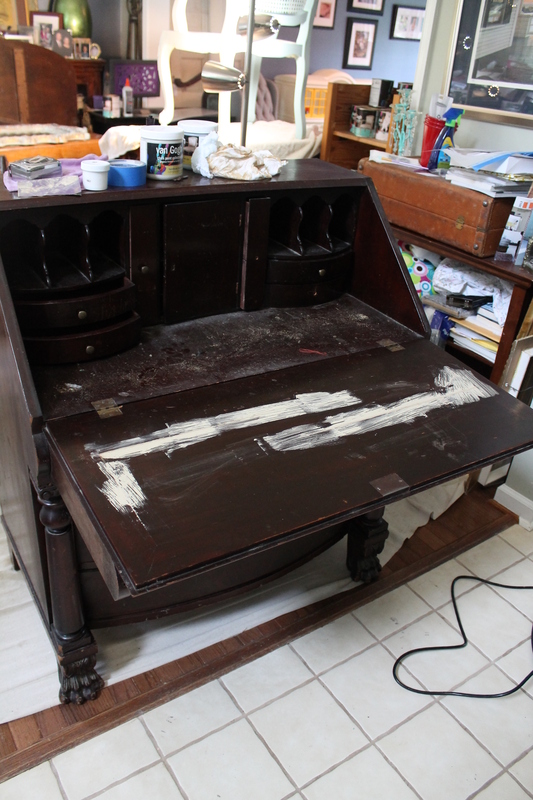 As you can see it needed some help… I filled in the cracks with wood filler (yes, these are not the TRUE before pictures, I forgot to take them with the large crack) and then sanded them back. 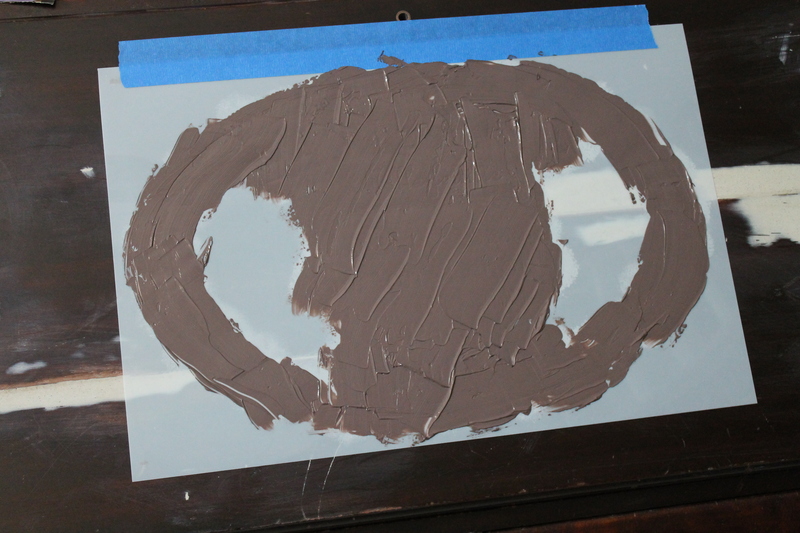 Then I taped the stencil to the front and smeared on the Furniture Facelift with a spatula. You may recognize this stencil from a coffee table I did a while ago. I like it and it’s big… Then you wait for it to dry… it takes a while…2 or 3 hours. 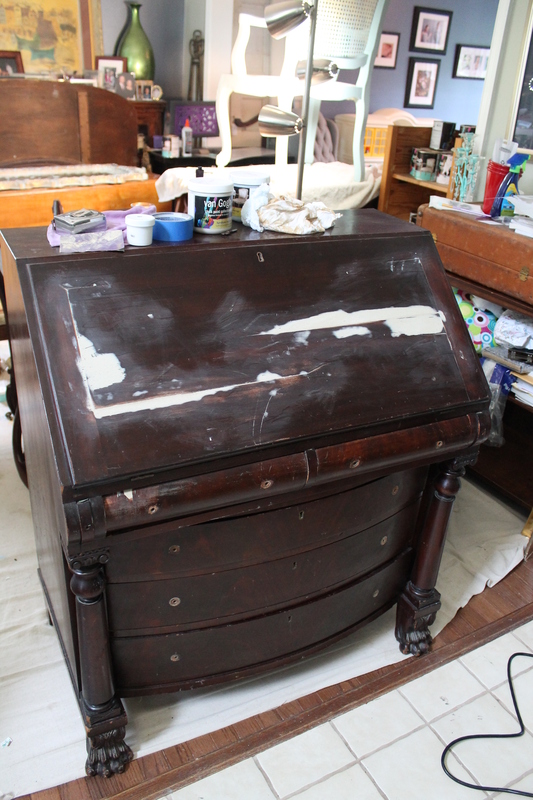 Once it’s all dry though, you can paint over it and distress it just like wood. When you’re a Paintologist with van Gogh, you can choose up to four custom colors that you get to name and are exclusive to you. Fun, right? I am trying one out and trying to decide if I want to keep it. 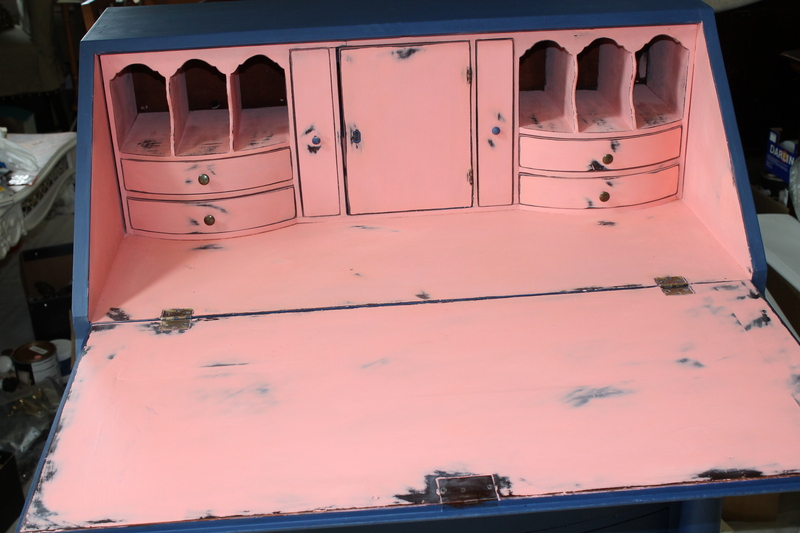 That’s the color I used a base on the door of this secretary. Then I painted Starry Night on top. 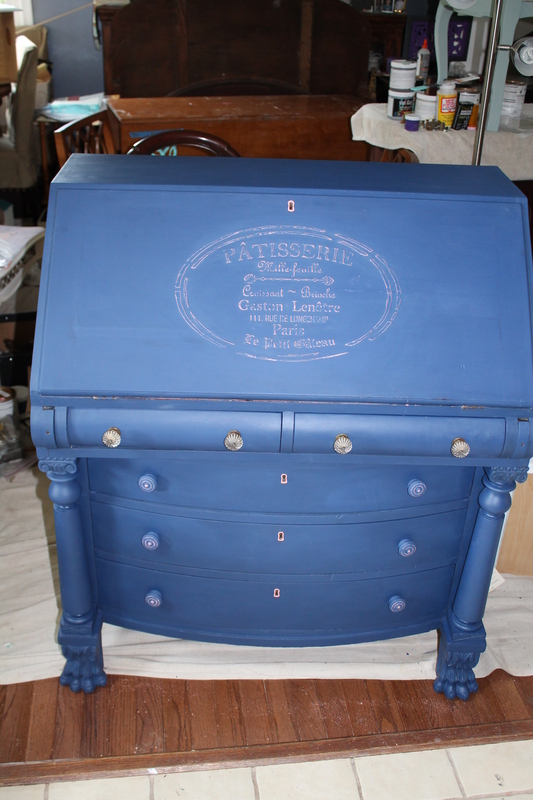 When it was all dry, I wet distressed it back to only the first color. It had mismatched knobs on it and they looked odd. 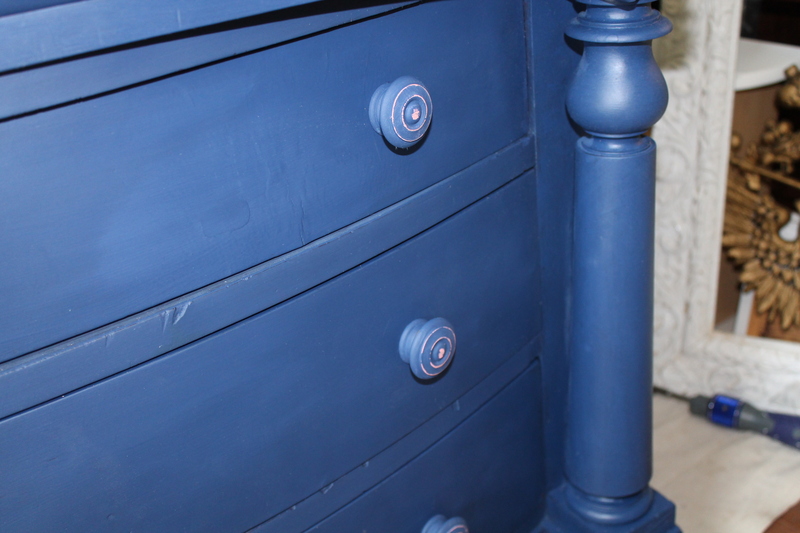 I went ahead and kept one set of the antique glass knobs on the top drawers and painted some wooden ones I had to match the color scheme of the piece for the bottom drawers. Inside I painted the piece with the new color and heavily distressed it. I tried some French Caffeine wax and didn’t like the look in this case so I used the natural wax to take it off. I love that you don’t have to Natural Wax before you use the French Caffeine wax and it still comes right off. What do you think of the new color… I’m leaning towards going a bit deeper I think. 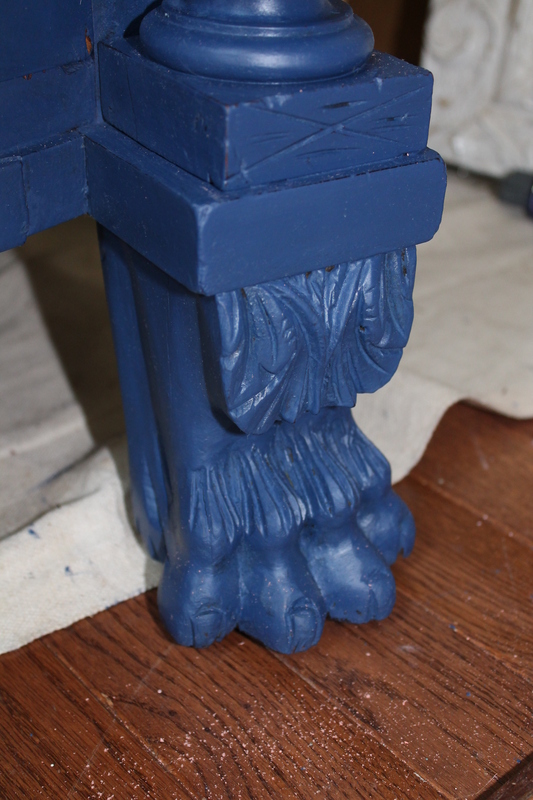 It’s a little lighter than I thought it would be even when you add the depth of the Wax. Love the effect of the stencil, not sue about the pink. I’ve just started doing projects like this myself and could definetly make a career of it! I have 2 pieces im working on now. As a matter of fact I saw mention on the chalk paint divas site about career opportunities with Van Gogh and I’d love more info. I totally agree about the pink.. luckily the camera doesn’t quite do it justice, it really is more of a coral (thank heavens)… I will send you an email now about van Gogh. Thanks so much for stopping by!! Scottie, you continue to create beautiful pieces and thank you for generously sharing your knowledge! Thank you Kathy, and thank YOU for creating such an incredible product that is SO much fun to use! Lol, you have to use what works. I would totally do that if I had the piece and wasn’t ready to fix it yet! There’s always a more pressing project isn’t there? Really nice. BTW. I’d paint the toe nails. Why not? You’ve already got “funky” going on…. I think I will on the other piece that was dropped off at the same time. it’s not exactly the same… might be a fun touch! Thanks for commenting!